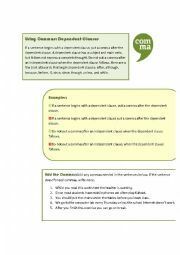 This worksheet introduces students to using commas correctly when connecting a dependent clause to an independent clause with a subordinating conjunction. 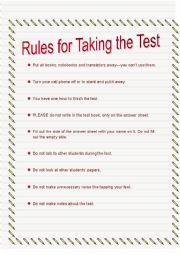 The students have the rule explained, several correct and incorrect examples, and practice questions. Black and white version and key included. 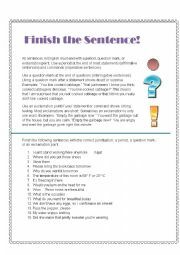 This worksheet introduces the use of commas when joining two sentences with a coordinating conjunction. Students see the rule, several examples, and practice questions. Black and white version and key are included. 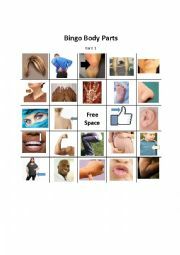 It�s bingo with parts of the body. This game covers 24 parts of the outside of the body, with 12 different cards. It comes with an answer sheet that can be printed on card and used for picking pieces. It�s also fully editable. I hope you find it useful! 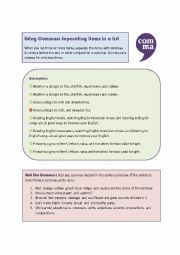 Here is a worksheet/guide to one use of commas in English. 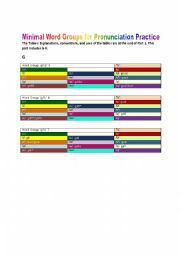 It�s fully editable, and a key and color and B/W versions are included. 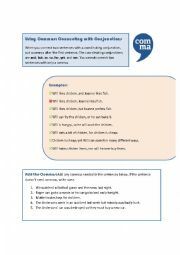 I hope it�s helpful! Here�s a simple exercise for students to practice using end punctuation: periods, question marks, and exclamation points. 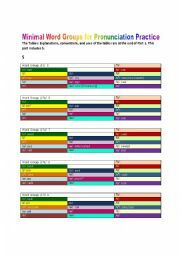 This worksheet has both color and B/W versions, and there�s also an answer key with explanations. I hope you like it!